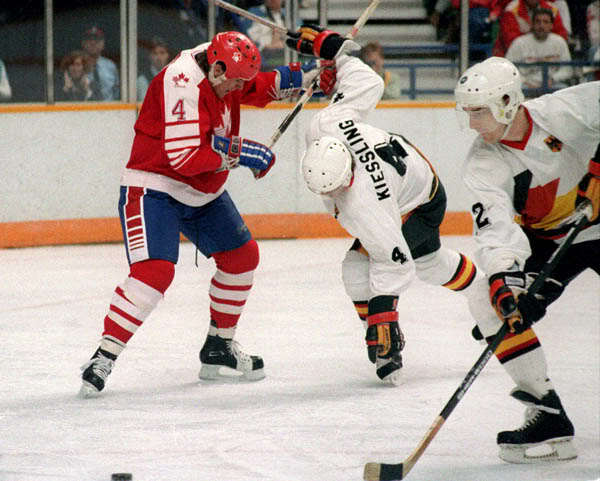 Former West German NHL defenseman UDO KIESSLING (4) tangles with his opposite number, TONY STILES of Canada, at the 1988 Winter Olympic Games in Calgary. Kiessling contested exactly one game for the Minnesota North Stars during the 1981-82 campaign. The fiasco that was the player eligibility controversy at the Sarajevo Games of 1984 led directly to the repeal of the age-old edict banning ‘professionals’ from competition at the Winter Olympics four years later in Calgary. “There are no more restrictions. Canada can use WAYNE GRETZKY if it wants,” declared the President of the International Ice Hockey Federation, DR. GUENTHER SABETZKI, declared on October 20, 1986. The UNITED STATES fielded two players on its national team who had been assigned for the season by NHL clubs, former Providence College goaltender CHRIS TERRERI from the New Jersey Devils organization and one-time University of New Hampshire forward STEVE LEACH of the Washington Capitals. FINLAND, meanwhile, fielded the former European NHLer with the highest profile — REIJO RUOTSALAINEN. The 27-year-old defenseman, who under then under contract to Swedish club HV 71 Jonkoping, was an All-Star Game participant for the New York Rangers and a Stanley Cup winner with the Edmonton Oilers.